At Goodreads, we’re currently in the process of decomposing our monolithic Rails application into microservices. For the vast majority of those services, we’ve decided to use Amazon DynamoDB as the primary data store. We like DynamoDB because it gives us consistent, single-digit-millisecond performance across a variety of our storage and throughput needs. Although DynamoDB excels at high-throughput read and write workloads, it’s not optimized to support one-time, ad hoc queries or data warehouse workloads. 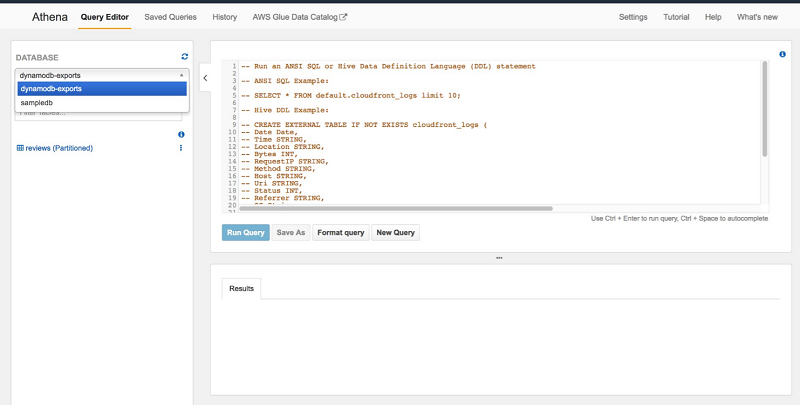 However, by combining AWS Data Pipeline, Amazon S3, AWS Glue, and Amazon Athena we can export our dataset from DynamoDB to S3 and use Athena to run SQL queries against that dataset. AWS Data Pipeline scans data from a DynamoDB table and writes it to S3 as JSON. It broadcasts on an Amazon SNS topic when it is finished. An AWS Glue job invoked by AWS Lambda converts the JSON data into Parquet. An AWS Glue crawler adds the Parquet data in S3 to the AWS Glue Data Catalog, making it available to Athena for queries. We could have queried the data in the JSON format, thus removing the extra step of the Parquet conversion. However, we decided to make the additional effort because Parquet is space-efficient and high-performing. For larger datasets, this approach translates not only into faster queries, but also cost savings. The major components of our architecture are described following. Data Pipeline is an orchestration service for spinning up Amazon EMR clusters and running fault-tolerant jobs using big data technology like Apache Pig, Apache Hive, or Apache Spark. Data Pipeline provides a template for exporting data from an arbitrary DynamoDB table to Amazon S3. We use a slightly modified version of the standard export template. In this version, we add the ability to send success or failure messages on Amazon SNS. Doing this lets us use Lambda to kick off further processing outside of the Data Pipeline service. A serverless Apache Spark environment runs a job that converts the JSON export from Data Pipeline into the Apache Parquet format. An AWS Glue crawler automatically crawls and infers the schema of our dataset and adds it to the AWS Glue Data Catalog. The AWS Glue Data Catalog is the metadata store for our dataset so we can query the data with Athena. Athena is used after the data is in the AWS Glue Data Catalog. At this point, you can query it in Athena with ANSI SQL. 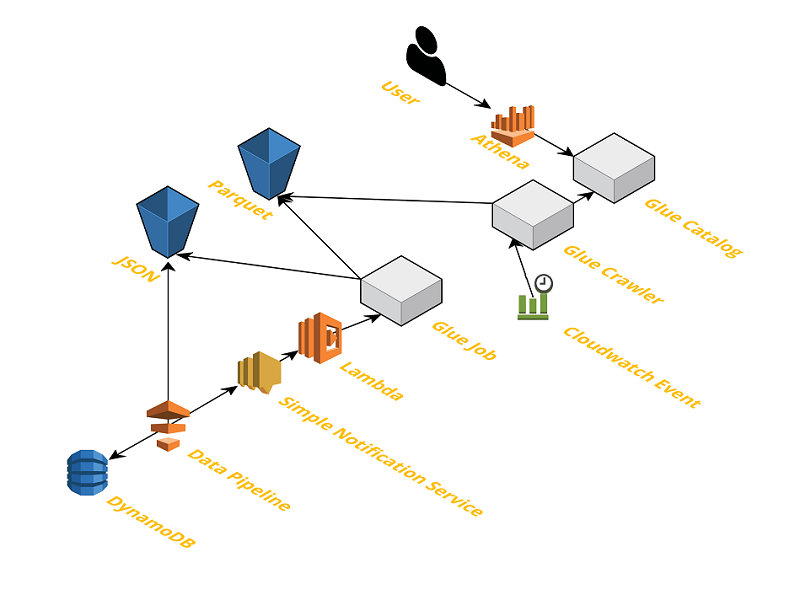 In this process, we use AWS CloudFormation to manage our AWS resources. We’ve split the various AWS resources across three stacks to make them more composable. The reviews.yaml template defines an example DynamoDB table called Reviews. The common.yaml template contains IAM and S3 resources that are shared across stacks. The dynamodb-exports.yaml template defines a Data Pipeline, Lambda function, AWS Glue job, and AWS Glue crawlers. 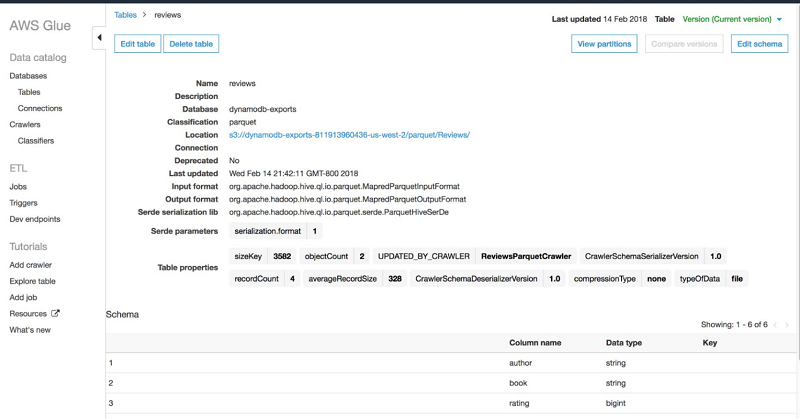 The reviews.yaml CloudFormation template contains a simple DynamoDB table definition for storing user reviews on books. We’re using a hash key and sort key structure that nests each review on a book under a particular user. This structure allows an application to check if a user has a review on a book in a simple get operation and also to list all reviews by a user. The table defined in reviews.yaml is a hash key and sort key table. The User attribute is the hash key, and the Book attribute is the sort key. If you build an application on this table, you might add additional Global Secondary Indexes (GSIs) to accommodate other access patterns, for example showing the highest weighted reviews for a book. Choose Next at the bottom of the screen. On the Options screen, leave everything set to the default and choose Next at the bottom of the screen. Open DynamoDB in the AWS Management Console. Choose Create item, and in the Create item box, for Tree choose Text. Remove the existing text, and copy and paste the item following into the text box. Now let’s add one more item. You can see that we’ve added a few different fields that were not specified in the table schema. Notably, these are: Rating, Review, and Author. Because DynamoDB is a NoSQL database, we can add new attributes as our application evolves. However, to aggregate against those attributes efficiently, they either need to be a part of the primary key schema at table creation or defined on an index. The Goodreads reviews table is not dissimilar from our example table. However, we have used our maximum of five Global Secondary Indexes (GSIs) to support the access patterns that our users need the most. It’s no longer an option for us to create short-lived GSIs to answer arbitrary questions we have about our data. Even if we could, we have so much data that creating a GSI creates a few days. Now imagine that our product team wants to run queries over the reviews data for arbitrary authors. We can’t add an additional GSI, and the access pattern isn’t required in production. However, by using the architecture described in this blog post we can unlock our dataset for our product team. Feel free to add more items to the table, because the more data you have in the table when we export it the more interesting SQL queries you can run in Athena. The common.yaml CloudFormation template creates a variety of IAM and EC2 permissions that Data Pipeline, Lambda, and AWS Glue use. In addition, the template creates a S3 bucket to store DynamoDB exports. The resources that need to be referenced across stacks are declared in the Outputs section. In the Capabilities section of Review, choose I acknowledge that AWS CloudFormation might create IAM resources with custom names. The dynamodb-exports.yaml template is a self-contained template to create a Data Pipeline, SNS topics, Lambda trigger, AWS Glue job, and an AWS Glue crawler for any given DynamoDB table. If you have multiple DynamoDB tables you want to export, you can reuse the dynamodb-exports.yaml template and create a stack for each table. The most interesting part of this stack is the AWS Glue job script that converts an arbitrary DynamoDB export file created by the Data Pipeline task into Parquet. It also removes DynamoDB type information from the raw JSON by using Boto3, which is available in the PySpark AWS Glue environment. The code is well-documented, so don’t hesitate to dive in here if you’re interested in how to write a custom AWS Glue job. On the Options screen, leave everything set to default and then choose Next. In the Review section, scroll to the bottom and choose Create. The pipeline from DynamoDB to the Apache Hive catalog is fully automated. After the CloudFormation stack to export Reviews is deployed, the data pipeline begins. You can query the data in Athena soon. Open AWS Data Pipeline in the console. Choose the pipeline with the name ReviewsExport. Monitor the pipeline as it goes through the various stages from provisioning a cluster to running your job. When the status is Finished, the data is in S3. The pipeline sends a message on the export success SNS topic. Doing so triggers Lambda to invoke the AWS Glue job to convert the JSON export into Parquet. Open AWS Glue in the console. Choose Jobs under the ETL header in the left navigation pane. From the AWS Glue console page, choose Crawlers on the left navigation pane. Choose the check box next to ReviewsParquetCrawler. Choose Run crawler at the top of the page. From the AWS Glue console page, choose Tables. The AWS Glue Data Catalog is an Apache Hive–compatible metastore that stores the schema of the dataset. It stores properties such as object count and dataset location in S3, among other data. Taking a look at the schema, you might notice the ddb_export_timestamp column, which wasn’t originally a part of the attributes that we added to the items in DynamoDB. Under the key column, ddb_export_timestamp is marked as Partition (0). Partition columns are just like regular columns, and when they are used in WHERE clauses in Athena they allow you to restrict the amount of data scanned. The Athena partitions documentation is a great place to start if you want to know more. The Lambda function that invokes the Parquet conversion script provides this extra metadata. So, when the AWS Glue crawler infers the schema, the partition is given a useful name, as opposed to the default partition_N name that is given if no partition name is present. Open Athena on the console. If you haven’t done so already, upgrade Athena to use the Hive Catalog. For Database on the left navigation pane, choose dynamodb-exports. Under Tables, you can see reviews. 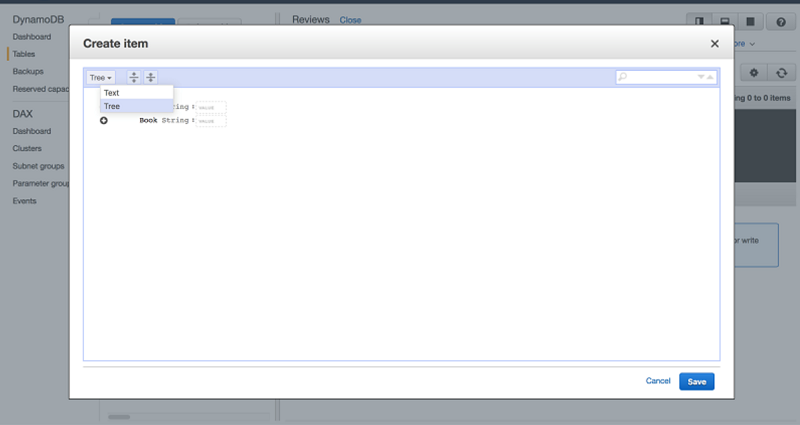 Choose the ellipsis at right of reviews, and choose Preview table. You just ran a SQL query over your DynamoDB dataset! Let’s run an aggregation to count how many reviews J.K. Rowling has. As you might recall, this access pattern isn’t well-supported by our DynamoDB table design. SELECT COUNT(author) as num_reviews FROM "dynamodb-exports". "reviews"
You might see different results if you added more items, but here are the results we see in our table. With Athena, as your data grows in size or complexity, you can pull insights out of data from DynamoDB using ANSI SQL. Modify the Data Pipeline to run the DynamoDB export every night at midnight local time to you. Run the AWS Glue Crawler every day at 4 a.m. local time so you always have the latest snapshot of your data in DynamoDB. Use the export success topic to trigger more complex pipelines or aggregations. Combine this approach with building a data lake in S3. Joe Feeney is a Software Engineer on the Amazon Author team where he leverages all of Amazon’s data to provide Authors with unique, actionable insights. He enjoys losing to his wife and kids at Mario Kart, and building and modifying guitars.